Summer is the best time for camping. But it’s also the biggest time for rain. Tents for rain will help keep you and your fellow campers dry as a bone even during big rain showers and thunderstorms. Rain proof tents are designed to keep you dry even in the wettest conditions. 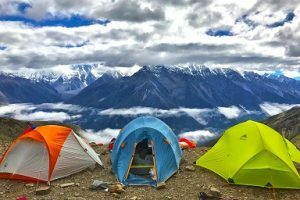 Looking for the best tents for rain? Check out these waterproof tents that will give you good shelter from any storm on your next camping trip. Need a big waterproof tent? This tent can hold up to 9 people! It’s got a detachable room divider, 2 doors and 3 windows. Assembly is easy with color-coded poles so you’ll never have to fumble around trying to pitch your tent. With 6-feet of height, you’ve got the feel of a home in the great outdoors. The double layer of polyester is laminated with polyurethane to keep out rain and UV rays. It also features a mesh mosquito barrier to keep out pests of all kinds, even no-see-ums, while allowing supreme ventilation and forest views. The Nano-Flex technology of the fiber glass poles keep it sturdy while making it easy to put up. This waterproof tent was originally built to camp in the Brazilian Amazon so it can stand up to any element. The bottom layer is unique too with a barrier bathtub-style construction to keep you from waking up in a wet spot. That means no matter how wet it gets outside, even the bottom of your tent will stay dry and comfortable. This is an amazing tent for rain, especially if you’re going with a large group of people. Bring your whole family and have the complete peace of mind that you’ll all stay dry and comfortable from the elements. The room divider is nice too, allowing parents to section off the tent from the kids. Plus the tall ceilings mean you won’t feel cramped when you’re camped. Coleman is one of the leaders in the outdoor segment. That’s why this waterproof tent is a solid entry. It’s a two-room tent of polyester that can comfortably sleep a maximum of 6 campers. The center height is 6 feet and 10 inches, giving you plenty of head room. A floor-less screened room is ideal for getting extra ventilation when it’s hot out or serving as a protected storage space. It has a vented Cool-Air Privacy Port and all mesh ceiling to really keep you cool. The proprietary WeatherTec System guarantees that you’ll be dry and comfortable in this tent. That means leak-free seams, weather-resistant fabric, waterproof floors, and strong wind frame will make your camping trip a success even if the weather is less than stellar. While smaller than the first tent option, it’s plenty roomy for a family. The separate rooms lend some privacy too. With state-of-the-art weather capabilities and ventilation, Coleman’s tent assures you’ll be comfortable whatever the weather, making it a smart choice for your next camping adventure. For a smaller tent that houses up to 3 people, this is a nice tent to keep you safe from the elements. Despite being smaller, it still offers plenty of room and makes it easy to get in and out with two D-shaped doors. The storage space stays dry for easy gear stowage. 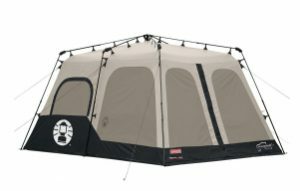 This waterproof tent stays dry from top to bottom plus the mesh canopy keeps out pests including no-see-ums. Secure setup is simple with color-coded fly and clips. There’s even a lampshade pocket that disperses light from your headlamp to provide an illuminated glow once the sun goes down at night. If you’re going on a camping adventure with one or two other people, this is a best waterproof tent. It keeps the elements and bugs out and even has a great place for a headlamp to brighten up the place at night. It also has storage so you can tuck away all your odds and ends and still have easy access to them. Get all of the quality of a Coleman with complete ease of setup that even a newbie camper can handle. 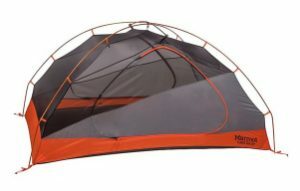 This instant tent is large and roomy for up to 8 people, plus it comes with 2 rooms. Best of all, the poles are pre-attached to the tent so that setup takes a minute or less. Along with the impeccable WeaterTec System, elements and bugs stay on the outside and even the floor remains dry as a bone no matter how wet it gets outside. This model has 2 doors and 7 windows perfect for full ventilation. Should you want to extend the living space in the tent, the divider is removable too. So you’ve decided to be hip and start camping but have no clue how to set up a tent. Or you just hate the time it takes to properly pitch your tent. With this model, setup is a snap. You can lock it into place and start enjoying your camping trip immediately. Plus, the waterproof tent design is guaranteed to keep you dry inside from roof to floor, making this a brilliant rain tent choice. Small families will love this 3-person tent. It’s spacious with a nice layout and a unique dome setup. It allows for plenty of ventilation with dual vents in the roof, door, and side walls with sealable mesh that also keeps out the UV rays from the sun. The double layer waterproof design keeps you and your things dry inside. A portable bag makes it easy to take along and it’s easy to put up and take down to ensure a comfortable and dry rain tent experience. If you’re looking for a smaller rain tent, this one will do nicely. 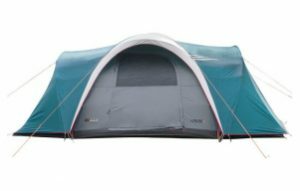 The dome-shaped design gives you plenty of room and the ventilation runs through it very well so you’ll never feel trapped in the tent even when you’re stuck there passing the time while the rain pours. Inside, you’re safe from the sun’s damaging rays, bugs, and rain, making it a great rain tent for a smaller camping party. Need a rain tent that sets up and takes down in a minute? This is the one! The carrying bag makes it easy to pack up and take along on even last minute excursions. It has dual doors and a rain fly which can extend out as a sort of pavilion setup. This waterproof tent stays dry all over even on the floor so you won’t be washed out. It fits 2 to 3 adults. If it’s just a few of you, this rain tent is ideal for fast setup and staying dry. If you’re not looking for a giant rain tent, this one will do nicely to keep you dry and away from the elements. Plus the rain fly is versatile and can be used for a canopy setup. Go big or go home. That’s what this rain tent is all about. 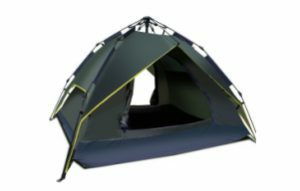 It’s the ultimate waterproof camping tent that fits up to 10 people and features a roomy door and 3 windows. It is also 6.2 feet in height to give loads of comfort. The full coverage rainfly keeps out water and provides UV protection. The large mesh vents make getting fresh air a breeze while keeping out unwanted visitors of the bug persuasion. Big utility pockets make it easy to stow gear and enjoy the space. 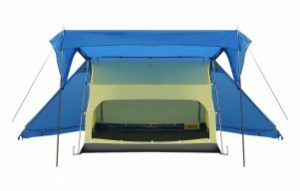 Floor material and design keeps you dry during the worst weather and the all over comfort of this rain tent make it a camping must-have. 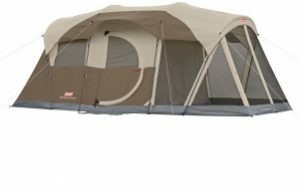 This is a great and quality rain tent for your next camping trip with a big group. With so much room to move around, you’ll feel at home while outdoors. While it doesn’t have separate rooms, it does offer plenty of headroom and protection from yucky bugs while staying dry inside, even on the floor, during the rainiest of weather. This waterproof tent offers a breathable polyester canopy, rainfly and floor, all sealed for full waterproof protection. 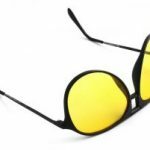 With fly designs that roll all the way up to give big views and more ventilation, they can just as quickly roll back down to provide supreme rain protection. This rain tent provides good waterproof performance and is easy to set up and take down within minutes. The large mesh roof gives a clear view of the sky at night while keeping out insects. It also has a tent lantern hook to keep the tent bright even at night. Storage pockets make keeping small items intact easy and accessible. Camping with up to 4 people? This waterproof tent offers a dry and bug free place to stay. With plenty of ventilation, amazing night sky views, storage, and even a lantern hook, it’s a great rain tent for a small group. 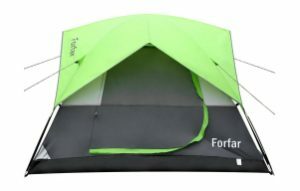 This fiberglass rain tent is super fast to set up and fold down. It takes 3 seconds thanks to an automatic opening structure. 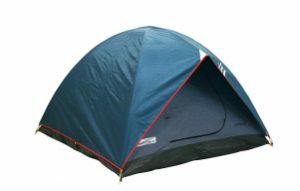 Ideal for a maximum of 3 people, this tent is guaranteed to be windproof, waterproof and durable. It protects against rain and sun and stays dry inside no matter how nasty the rain gets. The 2 large front doors make it easy to get in and out. Rear mesh panels and side wall vents give off views while maximizing airflow. The super light packaging makes it easy to carry and store, plus the inner tent and sun & rain shelter can be used together to form a wayward pavilion making it ideal for just about any outdoor adventure. For smaller parties, this rain tent offers everything you need to enjoy your outdoor adventure. The versatile pieces make it great for any outdoor retreat, and it’s easy to pack and store. Best of all, it keeps you dry and free of the elements, no matter how bad they get. 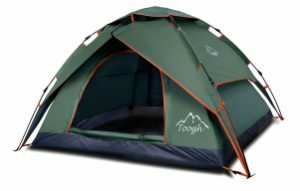 This best tent for 2 to 3 people is super light, not to mention waterproof, windproof, and bug-proof. The unique design provides 4 doors one on each side, allowing for circulation of air. The fly sheet can be a canopy or a sun shelter, plus it keeps bugs out. Whether you’re using it as refuge for a day trip or staying overnight, this easy-to-carry waterproof tent makes for a great shelter. 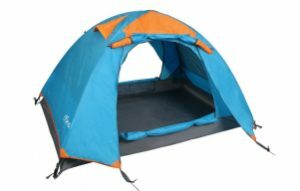 If you’re going camping with a few people, then this waterproof tent is ideal for you. It keeps out the elements while being easy to transport. 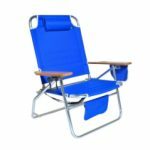 Because of its smaller size, you can also use it for outdoor daytrips such as fishing to give yourself a relaxing shelter free of the bugs, sun, and rain. The great outdoors can be very unpredictable. That’s why when you go camping, taking a rain tent with you is the smartest idea. All of these tents on our list are guaranteed to keep you dry. They also keep bugs out. But which one is right for you? If you’re frequently going camping with a large group of people, the bigger tents will be best. Especially the ones with the room dividers because they give you a bit more privacy. Plus those larger tents have tall ceilings so you won’t feel cramped. For smaller groups, the tents that can hold 3 people are best. Unless you want a ton of room for a few people, these tents are adequate in size and extreme in protection. Not experienced with pitching a tent or tired of spending time doing it? Then choose one of these rain tents that does all the work for you with no major set up required. Whichever one of these rain tents you choose, because they are guaranteed to keep you dry, you’ll be a happy camper for sure!